Conductor: There is none so blind as he who will not see. Over in the comments to Andrew's blog, Andrew and Norman have had a nice civilised chat about how people just cannot see that it is Conductive EDUCATION. People just cannot see the EDUCATION. They just keep seeing and saying "therapy"! First you have to teach people how to look, you have to teach them to see what they see and not what they think they see. I remember doing this once really effectively with a group of teenage boys at a secondary school for boys in Handsworth, in Birmingham. I had asked them to draw their shoes. You can imagine that in the 80s all those Asian boys had picked their shoes very carefully, so that they could wear fashionable black trainers with their school uniform, not the black leather brogues that their parents prefered. You would have thought that they would know what these prize possessions looked like, having chosen them with so much care and attention. For their first of two drawings they were not allowed to look under the desks at their shoes. They liked that game, they didn’t cheat, well not much. Not enough to make a lot of difference to the drawings. Then I had them put one of their shoes on the table. They were not very impressed with the results of their drawings as they didn’t recognise their own much-loved shoes. Before we started the second drawing we talked about forgetting that it was a shoe, and how to see what was really there. To look at shapes and angles and light and shade. They learnt how to use all of these to make their second drawing. They discovered that they could actually look and see something else, something that they hadn’t seen before, and that by doing so they could draw a very good presentation of their shoe. They didn’t see the deeply imbedded image of a shoe that they had in their mind anymore. They really did see their own shoe, with all the nobbly impressions that toes had made, and scratches that playing football had made, and tatty shoe-lace ends where the aglet had fallen off. And it was this that they drew, learning to look at the shapes in between and not at the object itself. It is not only when looking at the simple phrase "Conductive Education" that people fail to see. Even when looking at Conductive Education itself, in action, people still see what they think they see. For observers to see properly what is in front of them takes people skilled enough to retrain their eyes, and then to make connections to whichever part of their body stores what they see, their head, their soul, their heart. People observing Conductive Education also need to learn to look at the spaces in between that are just as important in my opinion, if not more so, than the more formal parts of the conductive programme. Just as drawing the spaces between objects helps to outline the form of an object, the spaces in between in conductive observation help define what is beginning to be learnt. Why have so many visitors to the Petö Institute or other conductive centres gone away and set up hundreds of different types of what they thought Conductive Education to be, what they thought they saw? Perhaps the "art teacher" was not there, the communicator, the eye-opener. Perhaps the visitors have rarely or never had it properly explained and there has been no discussion. That has been a terrible error, with terrible effects. There should have been someone to say "Look, what they are doing at this moment is not therapy because.....," or "It would be therapy if........" or "It's education because....."
Doing this properly can take a lot of time and patience. And it needs someone who has a clear ability to communicate Conductive Education. If that “eye-opener” is not there to do the explaining then you can't really blame people for not seeing what is in front of their eyes. Real educators can't blame them for not seeing what they are looking at, not knowing what to look at. And not learning the importance of the bits in between. I have experienced the need to do something about this so many times, to ask visitors to my group to refrain from chatting when they think there is a "break" in the procedures, when they see the clients walking to the toilets, going to wash their hands, walking to the table for elevenses, collecting plates and cups etc. from the kitchen. Clients doing the “bits in between”, doing what they have learnt to do, clients living and showing off their skills to the visitors. Visitors nearly always think these are times for a coffee break, they don’t see what it really is, they need their eyes opening, their vision directed. I always politely ask them to leave the room if they can no longer concentrate, if they feel the need for a coffee break, a chat and a breath of fresh air. "We're all going on summer holiday"
That's how I ended my last posting a couple of days ago and with summer holidays come the summer camps. I think that I have already made my feelings more than clear on this blog about people who run summer camps without providing anything like the help that parents often need if they are really going to see "Conductive EDUCATION". Here it is the parents who are often not being EDUCATED. Not learning what it is that is before their eyes. A bad failure for Conductive EDUCATION. Not a failure in learning but a failing in TEACHING. Managers and conductors who fail to educate the parents, year after year, are just rubbing in the confusion about Conductive Education that already exists, deeper and deeper. No wonder so many parents sincerely go into these camps thinking that their children will get a "therapy", and having spent a lot of money come away again none the wiser. People like to say that they have learned from the Peto Institute. Maybe they should learn from its mistakes too. Maybe start taking or providing "art lessons", educating those who show interest to see what they are looking at. The picture heading this posting is by my first drawing teacher at art school. He is the man who taught me, in 1975, to look at the spaces in between. He taught me how to see what I was looking at and also to realise that there are many different ways in which I can represent what I really see on paper, but still make an accurate replication. His drawing is called "Quickly Indoors", a title that relates to the name of the bike not to avoiding the bad weather. The bike is his German NSU Quickly, for which many years ago I brought home to England a suitcase full of spares. Now acquiring those spares was an adventure in itself, but that's another story! To me this picture is about life, life in the slow lane. 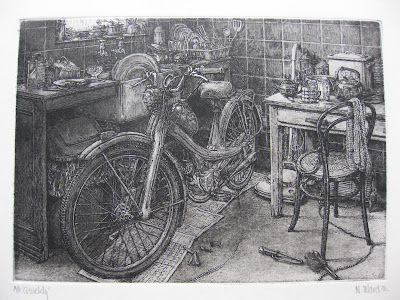 My own livingroom had a bike being fixed in it at midnight on Thursday, and looked a bit like this etching. A puncture slowed me down and I had had to walk home, late, after a Fest at work. Then I spent the rest of the evening on the floor relaxing with the bike repair kit, forced again into the slow lane, my favourite place. This is life. Just as Conductive Education/upbringing is life. Given a good basic understanding of what Conductive Education is, then it can be provided in many different forms, and improvised upon spontaneously as in a drawing. But without this understanding the ability to see the image is blurry, and it turns into something else. Who is blynder than he yt wyl nat se. There is no manne so blynd as he that will not see, nor so dull as he that wyll not vnderstande. But none so blind as he that will not see. Who so blind as he that will not see? As those that will not see. You know, there's none so blind as they that won't see. "None are so blind as those that won't see," whisper the wicked. Random House Dictionary of Popular Proverbs and Sayings by Gregory Y. Titelman (Random House, New York, 1996). "There are none so blind as those who will not see. The most deluded people are those who choose to ignore what they already know. The proverb has been traced back in English to 1546 (John Heywood), and resembles the Biblical verse quoted (above). In 1738, it was used by Jonathan Swift in his 'Polite Conversation,' and is first attested in the United States in the 1713 Works of Thomas Chalkley..."
Similar to There is none so blind as he who will not see. Cf. mid 14th-cent. Fr. Il nʾest si mavais sours que chuis chʾoër ne voeilt (There is no person so deaf as the one who does not wish to hear). So there you have it. There's a lot of it about and it's been going for a long time now. Like a lot of things in Conductive Education! "He is the man who taught me, in 1975, to look at the spaces in between." As a cyclist, you'll enjoy this odd parallel, I hope. I've been absorbed in the Tour de France. At the end of one packed and dangerous massed sprint finish, the expert commentator said something to this effect: 'Most riders just see the pack, shoulder-to-shoulder. The truly great sprinters see the spaces in between". Nice one Norman. Two actually. 'thinking outside the box', just as I before that I was deeply suspicious of 'lateral thinking', and still have my doubts on much of the abundant tosh served up under the rubric of 'creativity'. That said, all these (and much besides) do reflect a wider truth about rigidity and flexibility, both of which are very apparent in what Susie has raised here. I do like your cycling analogy. There is always a way through the crowd (and that is not necessarily 'the road most taken'). 2. http://thetherapyplace.blogspot.com. I have seen this too. I looked aghast. Your mentioning it here encourages me to return to it, which I will do elsewhere. And not to forget saying something important: yes, this is a brilliant posting Susie. Not for the first time you have said things that are rarely expressed publicly but really do need saying all the same. There is more to be said here too. Thank you Norman and Andrew, for your praise and comments. Thank you Judit too for your link. All especially special as it is a Sunday. I am a bit bewildered by it actually, by the praise. The posting is about me and what I see and how I am. By writing it and by reading your comments I learn more about the way I am and how I learn, thanks for that too. It is at times like this that I wish I had a television so I too could watch with fascination the Tour de France. I have always found it fascinating, ever since I caught a glimpse of it on a country road as a ten-year-old on a school trip to France. It was and is amazing to see how at high speed those riders find a niche between the other competitors. They make a move in split-second timing which will certainly influence their overall performance. In all activities the bits in between or the spaces in between influence the overall performance. They affect the end result, either positively or negatively. Even the getting up at midnight to get a cup of tea will influence the form of my blog posting! This summer I watched the Red Arrows perform, maybe you have seen the photographs I took on my other postings. It is only the spaces in between in their performances that make for such a spectacle. If they performed individually one could say “I have seen that done before”. With all off them in close formation everyone is looking at the spaces. With such precision, concentrating on the narrow spaces, those bright red planes makes an overall impressive “picture”. Thank you to Norman for the link to that website. You ask if it is Conductive Education. Who can tell? I didn’t really find enough on the blog to know one way or another. I only know what I see; then I can make my mind up about what I have seen. What I have seen beyond any smiling faces and wooden slats. By observing the bits in between! This reminded me of another blog I wanted to write. One about the importance of really looking at and seeing what is in the photographs being chosen for publication. Photographs to be included in blogs, brochures and websites are all too often telling very odd stories about Conductive Education. An experiment I do when I look at a new blog or website, is to ignore any text. I just look in my way at the pictures. I ignore any smiling faces and really see what I am looking at. Then I ask myself "What message do I get?". I wonder always if this is this the message that the bloggers etc. really intended to give. Again these photos can have a positive or a negative influence. They can tell me the truth they can tell me something else. I cringe sometimes at the photos I see, even in publications from respected Conductive centres. I have even seen myself on a website in photographs I would never have given my permission to print as being a representation of CE. Not because of what I am doing but because of the spaces in between. It is so important to look at the spaces in between before putting a photo before the public eye. And to look at the message the whole photograph is sending out, viewers do not only see the smiling face and wooden slats. It is important to ask "is this the message I intended?" Lots of food for thought Norman, thank you again. As Shakespeare said “What’s in a name?”. I called it observing the bits and spaces in between. You mention the clichés “lateral thinking” or “thinking outside the box” , both of which I also dislike and never use. The people I work with every day, children and adult clients, conductors, parents, carers, doctors, therapist, students, etc all seem happy with the phrases I use : “spaces in between” and “bits in between”. And of course there is also the “creativity” that emerges with “spontaneity”. Andrew, as I said above in the bit about photographs, I often look aghast when looking at websites about conductive centres. Sometimes I don’t even get as far as reading aghast. Pictures and their spaces in between often tell a story other than that intended. Actually, I didn't know what I was looking at in those photos on the therapy place website. Then I saw the furniture. And seeing the furniture put me in mind of something I once heard Andrew say (though I don't know that he will remember saying it): "It's not about the b***** furniture!". One of the most challenging aspects of having visitors is helping them to see something other than children-on-furniture. Or harder yet, to help them see children-on-furniture as engaging in an educative and not a therapeutic process. So, just as I hope most visitors to Paces are open (or can be opened) to what there eyes think they are seeing, so I must be careful when "visiting" other places - even as a guest to a blog. Nonetheless, I wonder, and many questions I would ask come to mind. I'm fussy about some things - spelling being one. And not writing "there" when I mean "their". (Last paragraph, previous comment; "their eyes". OK, so I used to be an English teacher in a former life!